Is your home feeling like a hodgepodge of all the furniture you have been moving from home to home for years? Do you want to change your decorating style to better fit your current lifestyle but are feeling a little uncertain as to how to begin? There are some tricks of the trade that may help. So before you head out to purchase a lot of “things” to “redo” your home, check these out and you will begin to find your decorating style. The goal is to transform your home from something that may seem a little stale or discombobulated into something that reflects your personal tastes. Or maybe a change into something that takes your home from drab to wow. Traditional style living room with colorful collections as accents, white walls and contemporary fabric, rugs. Maybe you have been living with shabby chic for a while and want to go contemporary with less clutter as is the current trend. Or perhaps you have just moved to Southwest Florida and want to make your home a little more tropical. This means having a plan and a willingness to make a (positive) change. So what will it be — contemporary, modern, classic, casual, Florida style, eclectic, traditional, transitional or a mix? It takes confidence and self-awareness and it may take a while to evolve. After all, it is your personal style, distinct and expressive of how you live your life. Most important: You need to love it. It’s a process. Think about how you want your home to look and work around it. Combining styles with this modular seating from West Elm, abstract artwork, wood flooring, vintage pieces and bold paint color results in a modern, yet natural look. Photo: West Elm. Interior designer Deborah Chase of Norris Home Furnishings in Fort Myers recommends beginning with something that you love and working from there. She says it is also important when determining decorating style to consider how you are using your home. Best-selling author and home design expert Lauri Ward of redecorate.com suggests “looking inside your closet for clues to your favorite colors. If you tend to dress in navy, camel, black and white, you probably will feel more comfortable living in a neutral colored environment. Beautiful Echo Design and the Windsor Smith Home Collection for Kravet set the tone for a casual, Florida style with bright colors and patterns. Photo: Courtesy of Kravet. Visit a fabric store and note what appeals to you. Set up a Pinterest board and begin following other pinners who have tastes similar to yours. This will help you to begin to collect some ideas about how you would like for your home to look. Visit model homes in the area and ask for permission to take photos of rooms that you like. Follow blogs that offer suggestions and photos that are compatible with your wish list. Favorites: apartmenttherapy.com, houzz.com. Create a vision board for one of your walls and include articles and photos from magazines that will give you ideas. Favorites: Home Beautiful, Better Homes & Gardens, Traditional Home, Coastal Living, Veranda. Your favorites will quickly become obvious. Look for trends. Visit home stores and design centers for inspiration. Take classes and seminars to learn as much as you can about decorating. Local favorites: Miromar Design Center in Estero and Norris Home Furnishings in Fort Myers & Naples. Remember: Finding and fine-tuning your decorating style takes time. If you need additional help, call a decorator or designer and have them help you pull it all together. 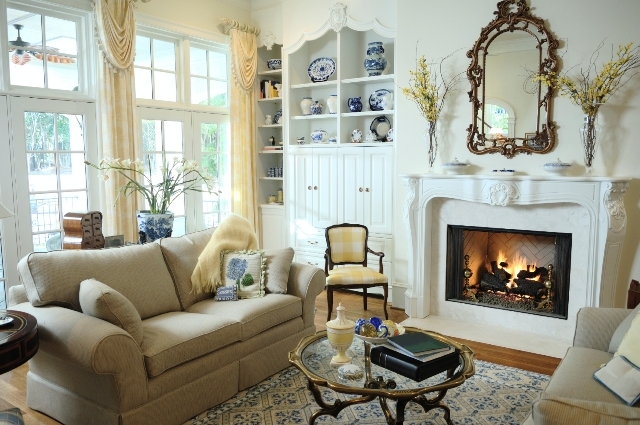 Wrenda Goodwyn is a Southwest Florida interior decorator. Visit her website at spectacularspaces.com. Call her at 949-1808 or e-mail wrenda@spectacularspaces.com. For more decorating tips and photos, visit spectacularspaces.com/blog.